Artifact of the Ages: Swords and Staves introduces magic weapons, staves, and rods that grow in power as wielders advance in level, allowing you to put artifact-caliber arms and tools in the hands of characters while maintaining balanced game play throughout a heroic campaign. 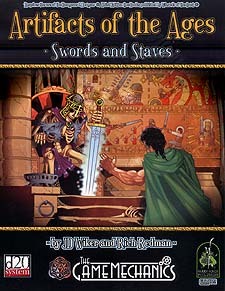 Artifacts of the Ages: Swords and Staves is a printed compilation of the first two titles in an innovative series of sourcebooks examinging new ways to treat magic items. Originally relased in PDF-format, the material in this book has been updated to incorporate player feedback and to be fully compaitble with the latest d20 System core rulebooks.